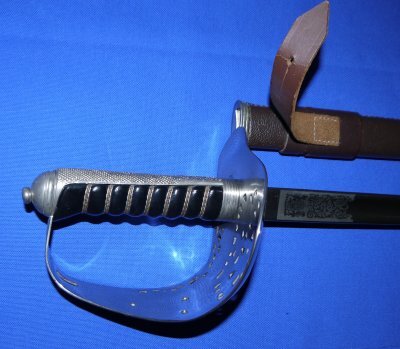 In very good condition, almost certainly German made, a British / Australian / Canadian / New Zealand ERII infantry officer's sword. In virtually parade ground condition, a superbly grey etched British infantry officer's sword. 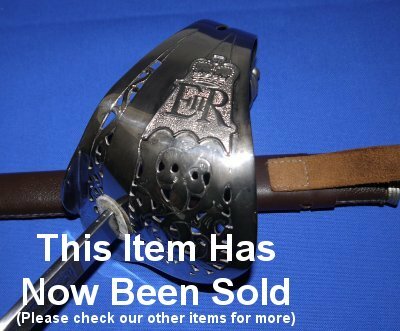 By the quality of etching, the slight squareness of the hilt (near the pommel) and the ebonized grip, we are 99.99% sure this sword was made in Germany. 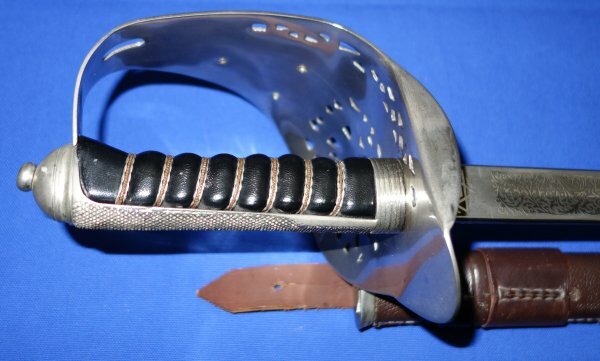 With a little careful TLC and a good plated metal polishing paste, we are sure this sword would come up well enough to fool people that it was new. The 32 3/8 inch blade is very well grey etched and firm in the hilt. The hilt is in very good condition, as is the grip and associated grip wire bindings, and which would clean up even better if desired. The leather field service scabbard is very good, some age / use cracking to the suspension loop and chuffing to the drag, but easily made to look inspection ready. A very nice sword indeed. Please quote item reference K45. Further / full sized pictures available upon request.